I know what you are thinking. How can a muffin save a life? Don't we usually use things like electrified paddles? This muffin is unique because it was made without any animal products. That's right folks, no butter, milk, or eggs in this recipe and you know what? They taste pretty good. In fact, they lasted all of 10 minutes in my kitchen after I made them. The life saving benefits of this muffin are attributed to the fact that they are made from plants. Last year, I wrote an article: How Did Bill Clinton Lose All That Weight? I talked about a research study where 82% of people that changed to a plant based diet have healed their arterial blockages. The research was done by Caldwell Esselstyn, JR, M.D. and really influenced Clinton on how he chose to combat his heart disease. Another "plant based eater" player is T. Colin Campbell who authored "The China Study". This study examines more than 350 variables of health and nutrition with surveys from 6,500 adults in more than 2,500 counties across China and Taiwan, and conclusively demonstrates the link between nutrition and heart disease, diabetes, and cancer. And guess what the healthiest participants ate? They stuck to a whole food, plant based diet and lived long healthy lives. A new documentary, "Forks Over Knives" (see below), explains their research and helps to promote their ideas. The book, "Forks Over Knives" is a companion to the movie. The book supports people with some entirely plant based recipes such as the one below. The book and the movie are powerful in explaining the benefits to long term health by eating a plant-based diet. When, I baked these blueberry oat muffins and I made a few recipe changes. First, I couldn't find sweet potato puree so I went with pumpkin puree (which you can find in the baking section). Secondly, I used oat flour and I made my own. How do you make oat flour? You just put a little more than 2 cups of whole rolled oats in your food processor and run it until it looks like flour. It worked great! These make a great "grab and go" breakfast or afternoon snack. Have you done any "muffin makeovers"? Recipe is produced by the permission of Julieanna Hever. Available in Forks Over Knives: The Plant-Based Way to Health. Published by The Experiment, July 2011, available wherever books are sold, $13.95. To order bulk copies contact: info@theexperimentpublishing.com. Preheat the oven to 375°F. In a large bowl, combine the mashed banana, sweet potato puree, maple syrup, and vanilla extract. In a small bowl, combine the oat flour, baking soda, baking powder, salt, cinnamon, nutmeg, and ginger. Transfer the mixture to the large bowl and mix together gently until well combined. Avoid over-mixing to prevent toughness in the final product. Spoon the batter into silicone muffin cups and bake for 20 minutes or until the muffins are lightly browned. Remove from the oven and let cool for 5 minutes. Store the muffins in an airtight container. Great Muffins! It is amazing how much dietary awareness makes such a huge difference! i think i'm going crazy, i can't believe i just seriously wondered about that. Also I understand that the China Study book is only there for studying diet really, but note that often times people in China (particularly rural areas or poor families) it's not that they're staying with a plant based diet due to them wanting to be healthy...it's more like they can't buy meat or eggs because it's too expensive/inaccessible for them. I'm Chinese myself and I went back to China few times to visit, and in the city the rich people eat like there's no tomorrow, while the poor will just have to scrape by (one location i visited that's in the city but in a very old neighborhood that was about to get torn down, the toilet was outside the "house" and it's essentially a pit). in any case, i'm not criticizing anything, but i'm starting to wonder about this whole "become vegetarian" slogan that's popping up everywhere. Is it because in the US if we don't try to drive home something extreme, it won't stick? So if I just say "eat in moderation, eat lots of veggies but also allow meat, fish, and eggs into your diet" will that just get ignored because it's not extreme enough? I noticed this article is filed under the gluten-free tag, but you use whole rolled oats to make the flour. To the best of my knowledge whole rolled oats have gluten in them. Do you use a special gluten free oat? Ahhh Shannon....Some people will NEVER give up their steaks and pork chops and they wouldn't be caught with a carrot, tomato or other "rabbit foods" in their mouths. We don't have to worry about overpopulation! Thanks for the tip on making your own oat flour! That's what i love about you, SG... always helping out with great tips! That saves me from making a trip to Whole Foods, which is more than an hour away. I have to settle for what I can find at my local grocery store out here in the boonies of East Texas. i'd rather people eat egg whites than high-glycemic, inflammation-causing sugars from bananas & maple syrup! Okay, I am not a fan of sweet potatoes, I've tried can you taste them in these muffins? AHAHHAHAHA XD you're right, I'm probably over thinking (due to being bored at work of course) it's just my housemate's vegetarian, another friend's vegetarian, and one of my coworkers (who is a YOUNG healthy adult white male, the last type for me to think is "healthy") is even more of a health freak than I am! In fact yesterday he was saying to me how he can't eat out any more because his body can't digest all the junk restaurants put into their food. At least he's not a vegetarian...he eat meat and fish and whatnot, but i guess just nothing junky. I'll be trying these muffins. They sound great! I'm made things with sweet potato puree before and I just use baby food sweet potatoes. Makes everything taste great! 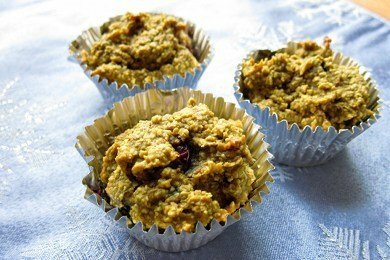 Although these muffins look great, and if you can make them vegetarian or vegan, why not? However, what most people don't know is that about 95% of people who are vegetarians or vegans end up going back to animal products (and I don't mean they just slip up one day - the become UNvegetarian or UNvegan). It's a difficult lifestyle to maintain for a lifetime. And personally, I see nothing wrong with sustainably raised animal products in moderation. Is the banana for moisture or flavor? Could I use yogurt instead? @Anna - regarding gluten-free. Regular rolled oats are not considered gluten free due to cross-contamination issues. However, you can purchase "certified gluten-free" oats. Oats themselves are considered gluten free - however, they are usually contaminated during the processing. I hope that helps! ~from a gluten free girl. I don't see the point of eliminating fats from our diets. This recipe sounds like it came out of the time when dieticians acted horrified of oils and fats which are essential for life. I can see modifying our diets like Sharon said. As for some people in the world eating plant-based diets; fine, but some people thrive when they eat meat. It isn't a matter of choice; it's a matter of individual body physiology and like Shannon also said, it's what people in China can afford. One diet does not fit all. Thanks SG for posting this yummy recipe. @Lauren for the record I have never hear snack girl ask anyone to eliminate fats from our diets. Eating foods that don't contain fats from time to time are good for you. These sound awesome, I will definitely be giving these a try. Sounds like my kids would like them too. The jury is still out for me on these. They didn't have the consistency of muffins, and they didn't rise at all. If you make them fill the muffin cups up to the top (plus a little more) since they don't rise. And this may sound picky....but they are orange, which is a little weird! I love bluberries, but they tasted a little bland for me. My girls will devour them in the morning because they love everything blueberry...but i don't think i'll make them again. I made these today. I used pumpkin, cause I was out of sweet potato's, and I used sugarfree maple syrup. OMG these were awesome, so moist inside like eating pumpkin pie, I think the key is to not overmix. My mom is diabetic and loved them....not too sweet. Thanks for posting all these recipes for us to try. can these or any of your other quick breastfast options be frozen? @Alex - you can freeze these and the cereal bars. I think I'm going to try these to add to scrambled eggs for Christmas morning!! I'm worried though because I don't have silicone muffin tins! Can I use a regular one, and would this change the cooking time? Also, should I use paper liners or just spray the tin? Snack Girl does it AGAIN!! @Laura Jo - I would use paper liners - they work great! Thanks for the question. Check out my pics on my blog! Can you use sweet potato baby food as an option instead of the pumpkin? @kris10lee - that will work! i saw this from a link from one of your more recent posts, added protein powder & wheat germ instead of flour, and used sweet potatoes. SO GOOD! Omg! I can't not wait to make this! I love blueberry muffins, and always feel so guilty about eating them, haha. But this looks amazing. Although I like your website, plant based intake is not appropriate for all people. It makes me ill, increases my triglycerides and my blood sugar, and makes me anemic. Also gain weight. Meat plus veggies and good animal fats give me a much more stable result. Blood sugar normalizes and triglycerides are now normal.